For when warm weather is enticing enough to wear your jean shorts to work (and provided your office culture allows for some wardrobe creativity! ), make a statement. Keep this look sophisticated and professional by choosing a neutral blue cuffed short with a slightly longer length. These medium-length stunners from Joe’s Jeans fit the bill nicely. Pair them with a feminine heel to complete your office ensemble. Channel your inner James Dean and rock a darker denim. J Brand adds extra edge to their Rita Zipper Cut-off shorts with double zippers. Add a vintage leather jacket and a white tee to gain instant indie street cred. Coachella attracts notoriously wild fashion statements from concert-goers. Set yourself apart from the crowd and choose denim with interest. The delicate stitching and light fade on these D-DID shorts pairs seamlessly with a loose white blouse to keep you cool in the Cali sun. 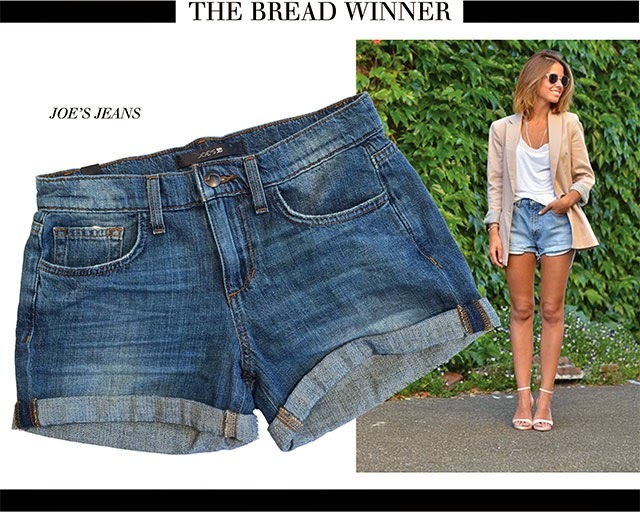 Every girl’s closet needs that staple pair of denim shorts that are tried and true. The high-waist on these Current/Elliot Bicycle Jean shorts is flattering and versatile. Add a chic striped tee and structured blazer and you’re ready to conquer the world. For more styling tips and perfect denim pairings, visit us in the store!